Hi everyone, as many of you know I’m crazily sewing costumes for my shop. 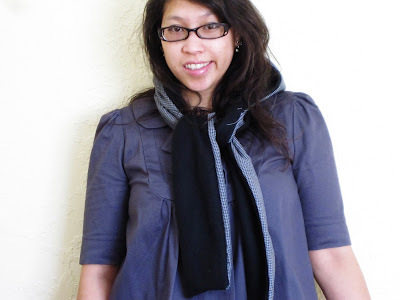 But I wanted to let you know I wrote up a cool tutorial for a hooded scarf that I’m really proud of and am sharing it over at Some Day Crafts. I hope you head on over and check it out they’re quick and easy and would make great gifts for those people you don’t know what to give to. Blueberry White Chocolate Cheesecake recipe Yup I tried to copy that delicious beast from the cheesecake factory and I think it turned out pretty close. 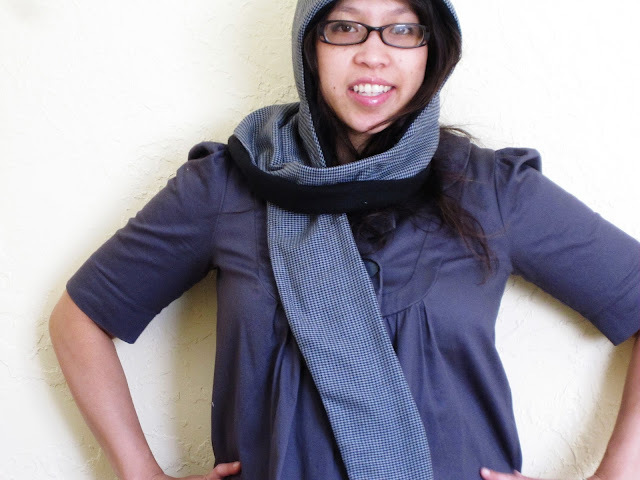 Today I want to share a quick and easy tutorial for how to make your own hooded scarf. These are great because before things get too cold you can wear them with a light jacket or cardigan to boost your warmth. Or if you’re anything like me they are the perfect solution to those adorable, but hoodless winter coats. You can easily make the pattern for adults or kiddos. This year I think all the guys in our family will be getting one of these (they can be so hard to shop for). 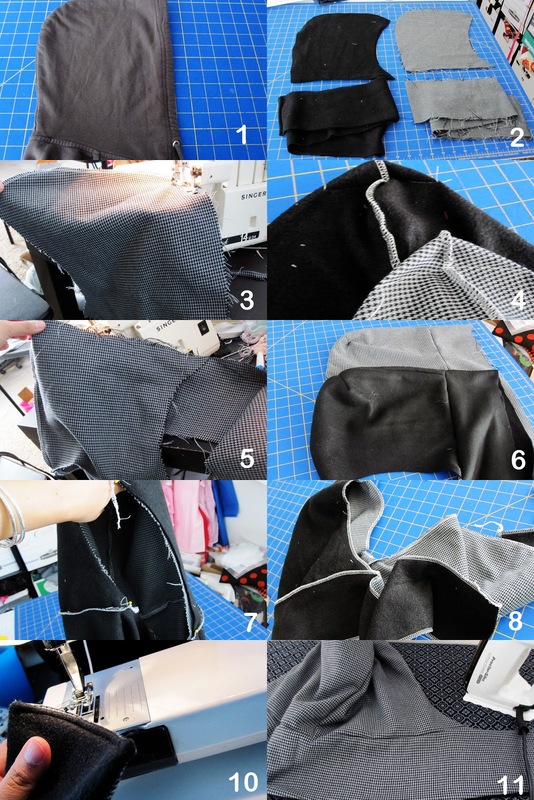 either a hood piece from a sewing pattern or a hoodie that you can trace to make your own hood pattern. First either find a hood piece from a pattern you have or grab your favorite hoodie fold it in half and then trace about an inch around it to make yourself a hood pattern. It doesn’t need to be exact, hoods are really flexible. Cut two hood pieces and 1 scarf piece (the scarf pieces I cut were 5 inches by the length of the fabric so in my case 5×44 and 5x 50) out of the main fabric and the fleece. Your fleece may be longer than your other fabric which is totally fine. If that’s the case just lay the shorter one on top of the longer one and cut the longer one down so they are the same size. Sew, right sides together the two fabric hood pieces together around the curve (the part that would go down the middle of your head. Do the same with the fleece. Try the hood on and see what you think. If you like a more fitted hood you can do what I did and sew across the point of the hood on each. Do this on a sewing machine so you can unpick if you don’t like how it looks. Try it on and if you like it with the line sewn across cut off the extra nub at the top.This is totally optional but I like the shape better. Now pin the center of the scarf piece to the center seam of the hood (right sides together) sew the hood piece to the scarf piece. Do the same with the fleece. You should now have two hooded scarves. Next pin the two hooded scarves right sides together. Sew around all the edges leaving one of the skinny ends open. Right side out out everything. Close up the hole by tucking the ends under a little and sewing close and iron the the hooded scarf (it’s best to iron from the main fabric side (not the fleece side). You can wear it wrap style like the top picture, tied, or with the hood down completely. I sewed a lot of this on my serger but since all the seams are enclosed you can do it all on a regular sewing machine. I’d love to know if you try this out and definitely would love to see pictures. And I hope you’ll stop by my blog and say hi. I might need to make one of these, since I just bought a wool coat without a hood! Love this idea..especially since the winters here are soo cold! Very cute and the instructions sound very easy. These will make great inexpensive gift for Christmas. One tip for anyone who is going to make these: Don’t forget to check the remnant rack at the fabric store, there always seems to be a ton of markdown fleece remnants at this time of year! I SO NEED ON OF THESE. Maybe a couple for the girls too. Thank you for linking up to More the Merrier Mondays. I so love this tutorial! It is so informative and I think my subscribers would really enjoy reading this. I would love for you to come share it at Frugal Days, Sustainable Ways on Frugally Sustainable this Wednesday. And, I really hope that you will put Frugal Days, Sustainable Ways on your list of carnivals to visit and link to each Wednesday! Super cute…adorable and creative..Love it..
Fun! The hood would keep the scarf centered, which always bugs me when it gets messed up. Great tutorial! Perfect with the colder weather getting closer. Very cool! Too bad it doesn’t get cold where I live, but I really like the concept! This is just awesome! I love this idea!! I might have to make one for myself!! Love how yours turned out! Looks amazing and super warm! Pure awesomeness! So much potential here for gifts for the loved ones in your life. This one is definitely being shared. Found you via itssoverycheri.com linky party. L.O.V.E. this idea!! Thanks for sharing @’Sew Cute Tuesday’! I’ll be featuring you tomorrow, so be sure to stop by and grab a ‘featured’ button! Wow, what an easy way of explaining things, thank you SEW MUCH! I started making a matching set for my son, grandson (made my own without a pattern) and left it sit for a couple days………and found your page. Looks like they’ll get them in time for Christmas, GREAT EXPLANATION and I totally “got it” when you explained to make 2 of them identical and sew them together…..wow, pisacake – thanks again!